Thanks to Ann of Zoolarty for this Graphic! If you have trouble watching the movies just click the links below and they will open up in youtube. I hope humans come to their senses and learn to take care of earth's beauty. SPEEDY BOY! Hello my darling little friend....it's our only home, and I hope that her future is a bright one. We are the inhabitants of a marvelous place, and thank you for always showing us the best of the best in your area. Go out and have a blast on this gorgeous weekend! It's my birthday on Sunday! Hi there Speedy. Looks like you had some good walks all over our good Earth. It is so important to take care of our earth. You sure do enjoy your part of the planet Speedy! 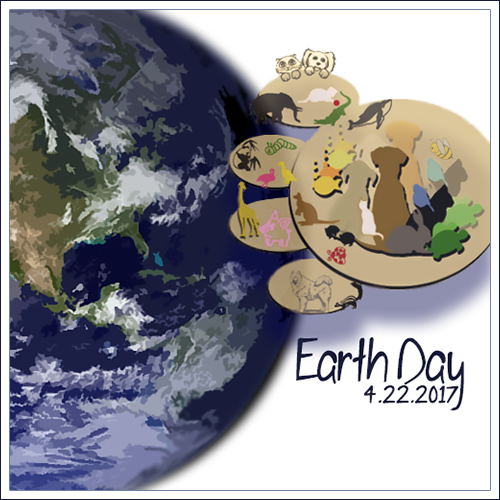 Happy Earth Day from all of us! You asserted your independence and went under that gate! Happy Earth Day, Speedy. Now more than ever, we humans need to take care of our planet, for the good of all living things. We are working to make the earth a little bit better every day! The earth is our home. The only one that we have. I hope that one day everybody will understand that. In the meantime ... enjoy the big outdoor with your Mum Speedy, as I do with mine. You do have a very nice woods there, Speedy. We love to walk along the trail that borders the woods near us. We are often appalled at how bad some humans are about littering nature with its trash. Happy Earth Day! I can see why this is your favorite woods. You really were hopping along in the third video. It's so important that we take care of our planet and keep it safe for all the critters to have as their home.